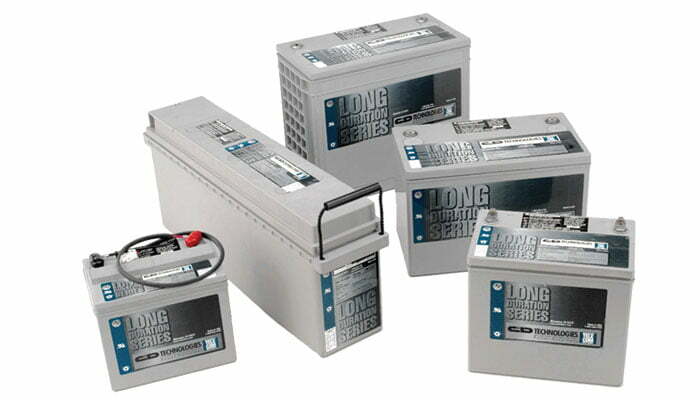 TEL Series Long Duration batteries are designed to provide standby power to critical applications in the Telecom industry. The TEL series long duration batteries have undergone extensive life cycle testing, including SR4228 compliance, to ensure the longest and most reliable service life possible. With a range of capacities from 30 to 125 ampere hours and many installation options including relay racks, cabinets and more, the TEL Long Duration series is suited to a variety of applications within the Telecommunications industry. Maximum AC Ripple (Charger) AC Ripple Voltage - 0.5% RMS or 1.5% P-P of charge voltage recommended for best results. AC Ripple Current - Max current allowed = C/20 AMPS RMS (5 AMPS RMS Per 100Ah). lower temperatures. See C&D bulletin 41-7272, Self-Discharge and Inventory Control for details. 10-32 UNF 3⁄8 inch long screws for: TEL12-30, TEL12-30SLC, TEL12-45 & TEL12-45SLC. 1/4-20 UNC 3⁄4 inch long screws for: TEL12-70, TEL12-80, TEL12-80SLC, TEL12-90, TEL12-105FS, TEL12-125 & TEL6-180. Inserted Copper Alloy Terminal Hardware Initial Torque 30 in.-lbs. (3.4 N-m) for 10-32 hardware. 110 in.-lbs. (12.4 N-m) for 1⁄4-20 hardware. See datasheet for more detailed specification including discharge tables. NOTE: TEL12-105FS replaces TEL12-105F. TEL 12-105FS is 0.56 inches (14.33 mm) shorter than the TEL12-105F. UNIPOWER is a world leading provider of dependable high‐efficiency power electronics and energy conversion systems and power supplies. UNIPOWER solutions include a complete line of high-efficiency rectifiers, inverters and DC power systems for mission critical applications. With over 25 years experience supporting customers in more than 60 countries, UNIPOWER is focused on bringing reliable power solutions to customers across all applications and environments.